There are a plethora of factors that go into planning a conference or meeting. But did you know that the conference room you choose can actually make a big difference? The professionals from Hotel Mead & Conference Center in Wisconsin Rapids, WI, have a wide selection of conference rooms to choose from when it comes to your business meetings and more. Location: The location of your event space must be easily accessible and convenient for everyone who is involved. As Wisconsin Rapids’ only full-service hotel, Hotel Mead & Conference Center is the perfect option for a reliable location. 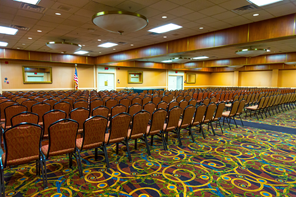 Capacity: With 11 meeting rooms to choose from, Hotel Mead & Conference Center has a variety of options when it comes to the capacity of your conference. Both large and small groups have conference room options available to them. Equipment: It’s essential to have the proper and necessary equipment for conferences. The meeting rooms at Hotel Mead & Conference Center have high-speed internet, as well as audio and visual equipment with technical support available upon request. The professional staff from Hotel Mead & Conference Center is available during conference meetings to ensure your business gathering runs smoothly. They have the technical staff to help with the logistics of the meeting, as well as a business center for added convenience. Are you planning a business meeting and are in need of variety of conference rooms to choose from? 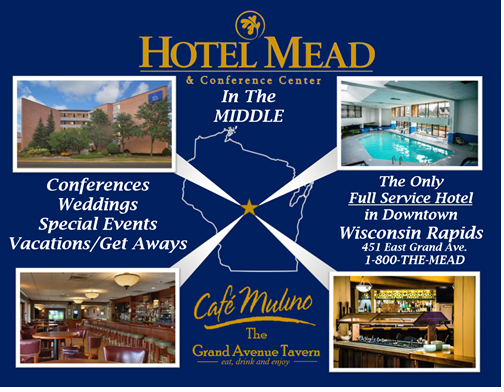 Take a look at the nearly dozen options from Hotel Mead & Conference Center in Wisconsin Rapids. Give them a call today at (714) 423-1500 to ask about their event space availability, or visit their website to learn more about the rooms and suites available.